This post has been a long time coming. To be honest, longer than I would have liked. The simple truth about it is this: Silent Hill 2 is my favourite video game of all time. Hell, one of my favourite pieces of art, period. So, when I set out to start this series, I knew the logical place to start would be here. But I wanted to do it justice, since this game means so much to me. I have restarted and redrafted the post several times over. Some came in too short, others came in way too long. I hope what I’ve got here is a nice middle ground. 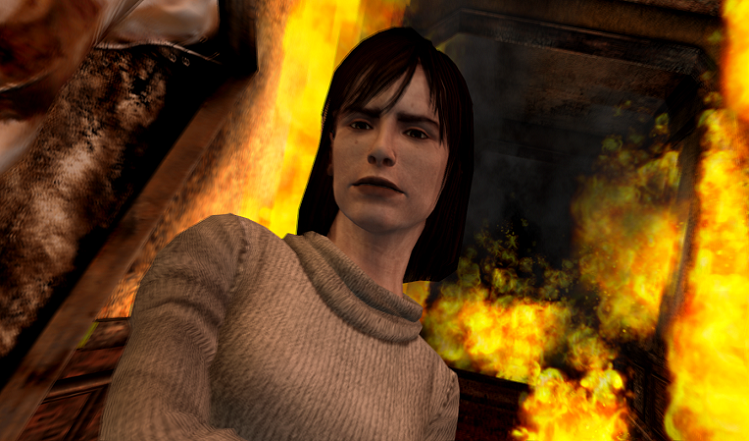 This post contains massive spoilers for Silent Hill 2, up to and including the ending! Even by today’s standards, Silent Hill 2 is a dense game. Not necessarily in terms of mechanics, which were fairly standard for the genre back when it released in 2002, but in terms of its story and characters. It attempts (and often succeeds) at being a horror story, a mystery, and even a love story, all conveyed through its strange cast of characters and monsters, several of which have gone on (for better or worse) to be iconic symbols of their own right. But, as with all things, we must start at the beginning. The very start of the game has our protagonist, James Sunderland, on the outskirts of the town of Silent Hill. As he explains in his opening monologue, he used to come to the town on vacation with his wife Mary, before she died of a disease three years previously. And now he is back, after receiving a letter from her, saying she is waiting for him in their ‘special place’. This, ultimately, is the core mystery of the game. How can someone who has been dead three years write a letter? Where exactly is this ‘special place’? As James says in the monologue, “This whole town was our special place.” It functions as a solid hook, even if it bears some similarity to the first game’s inciting incident of Harry Mason attempting to find his missing daughter. 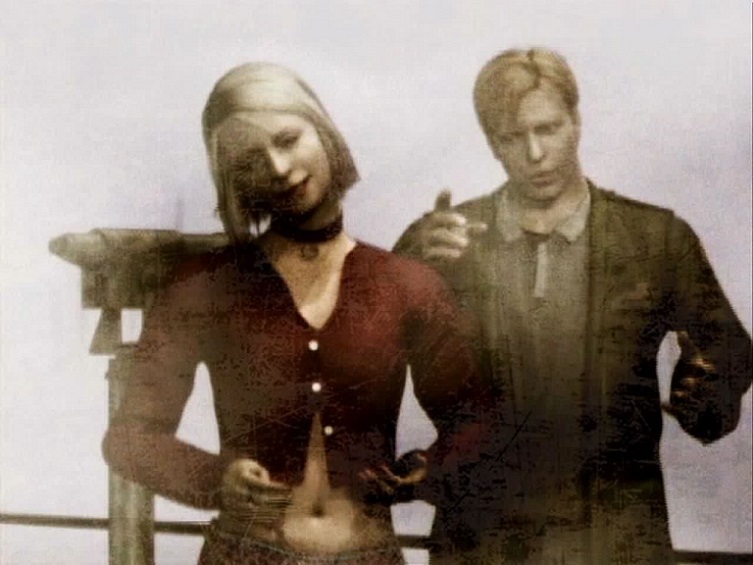 But whereas the first game’s story devolved into nonsense about a doomsday cult, Silent Hill 2 is ultimately a character study, more focused on James’s internal struggle, and themes of love, loneliness, guilt, and resentment. During his journey through the forsaken town, James encounters several more characters, each with their own problems and their own reasons for being there. Laura, an obnoxious eight year old girl who has run away from an orphanage, and is presumed to also be looking for Mary, and Eddie Dombrowski, an overweight victim of bullying who is given to violent outbursts, and possibly murder as his sanity deteriorates. But perhaps most interesting to James’s story is Maria. Maria is not your standard denizen of the town. In fact, much like the monsters James encounters, she is a creation of the town itself, specifically made to get in the way of his mission to find his wife. You see, James and Mary didn’t have the happiest of marriages. Throughout the game we’re drip fed hints that James resented her for several things, the most notable being that she was never the hot party girl he’d always envisioned himself with. Enter Maria. A woman who looks and sounds exactly like Mary, but dresses and acts in a sexier manner. She plays the role of both temptress and tormentor, a reminder to James of what he always secretly wanted, and what he was finally driven to do. 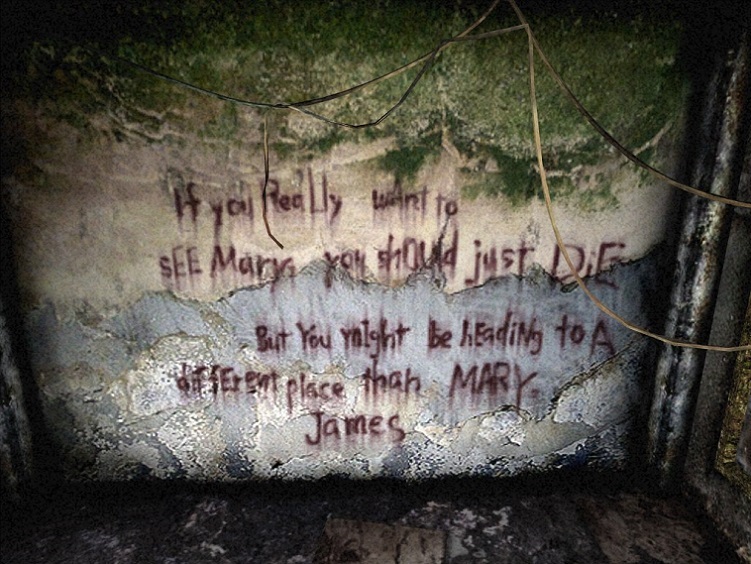 Maria is murdered three times throughout the game, each time an escalation over the last, the third and final time being a brutal execution in James and Mary’s “special place” the Lakeview Hotel. The town knows the secret that James has made himself forget. Throughout we are given small hints that things are not what they seem, from Laura having known Mary just a year before (meaning Mary couldn’t have died three years ago), to this fairly well hidden message. The truth James discovers at the end of his journey is that Mary didn’t die of the disease at all. He killed her. Through a mixture of love and not wanting to watch her suffer any more, and resentment at her taking his life away from him, James smothered his wife with a pillow, and his mind snapped in the process. At the end of the story, James attempts to redeem himself based on the player’s actions throughout the game. The most common ending features James leaving the town with Laura in tow, presumably to fulfil Mary’s wish of adopting the young girl. Another ending has James drive his car into the lake, in the hopes he will be with Mary again, while yet another has James leave to start a new life with Maria. The developers haven’t declared which ending is canon, and the game has no direct sequel, so it really is up to the player how James’s story concludes. But what of the other characters and their stories? In what is perhaps a departure from standard game design, the other characters (aside from Maria, for obvious reasons) aren’t just there to support James. Eddie, for example, is a sociopath. Having run away to Silent Hill after killing a dog, and shooting a football player in the leg for making fun of him, he gradually becomes more unsettled over the course of his chance meetings with James until their final confrontation in a meat locker filled with bodies. When Eddie finally snaps and tries to kill James, the player is forced to react in self defence and kill him. Angela Orosco is even more esoteric. At first she appears to be a normal, if shy, teenage girl looking for her family. But through the course of several encounters, it transpires that she stabbed her father for physically and sexually abusing her as a child. The final meeting takes place in a fiery stairwell, in what is possibly the most emotionally affecting scene of the game. Angela points out that the world always looks like this to her, before disappearing up the stairs, never to be seen by James again. She isn’t a supporting character in the strictest sense. Her arc has nothing to do with James at all, and remains unresolved aside from that singular moment of empathy. Angela is a protagonist in her own right, albeit one we, as an audience, never get to see the point of view from. As a departure from the fundamentals of game narrative, it’s a welcome one. All too often characters seem to exist only to further the player’s quest, or are just around to have their problems solved by the player. BioWare games and other RPGs are especially guilty of this, with NPCs (non player characters) often just stood around waiting for the player to come along and take up a quest to resolve whatever issue they have. In a way, it’s understandable. Games are an interactive medium, and quest givers are an easy way of making the player feel involved on a grander scale. But something is lost in the process. Angela and Eddie feel like real people because they try to solve their own problems rather than relying on the player. It’s an example more games could benefit from trying to emulate. It is, of course, impossible to discuss Silent Hill 2 without discussing its cast of monsters. The designers had the forethought to even invoke the game’s themes in the monster designs, particularly the straitjacketed Lying Figure, which gives a representation of claustrophobia and feeling trapped. But above all the others, it’s two designs in particular that really cement the game’s legacy. The first is the nurse monster. The first game had nurses in the Alchemilla Hospital area, but they were modelled more on old fashioned nurse uniforms with the small caps, perhaps based on the hospital scene from Jacob’s Ladder. 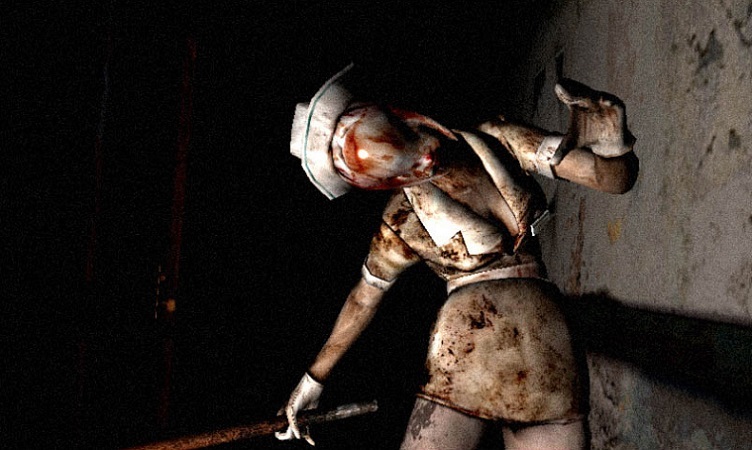 In Silent Hill 2 however, the nurses have a more modern, and dare I say sexier design. The thematic function here is twofold; both a reinforcement of the sexual frustration theme embodied by Maria, and some subtle taunting about Mary’s extended hospital stay. The second enduring design is that of the Red Pyramid boss, more commonly known as Pyramid Head. With apologies to fans of Nemesis from Resident Evil 3, Pyramid Head is arguably the genre’s most iconic design. The trouble is, I’m not sure he should be. Over the course of James’s story, Pyramid Head serves a very specific function. 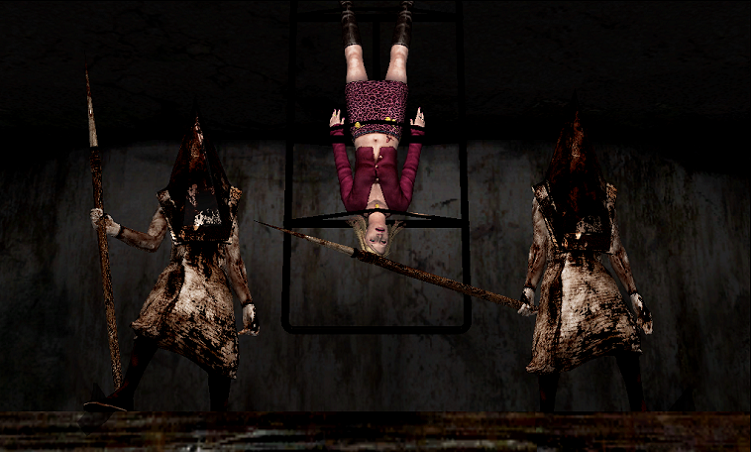 Every time Maria dies, it is Pyramid Head who murders her. He is both James’s tormentor, and a manifestation of James’s own guilt and buried memories, taking the physical form of a monstrous executioner. His body is perhaps the most ‘human’ of all the game’s monsters, while the angular shapes of his head suggest pain. 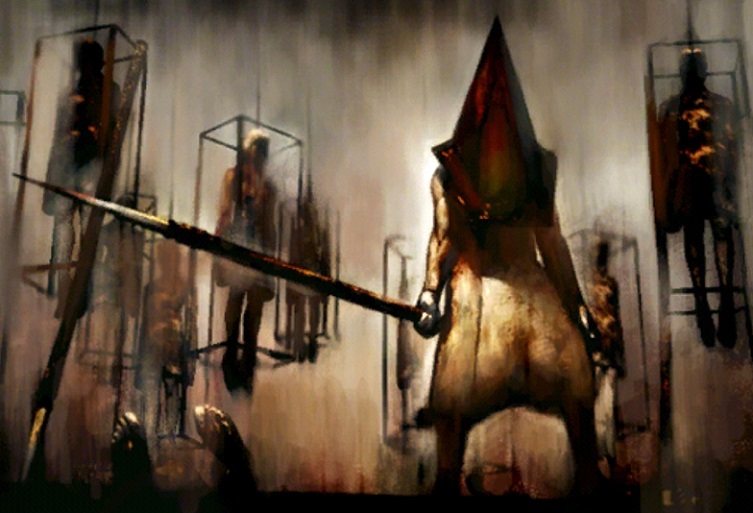 In short, as a design, Pyramid Head is inextricably linked to James’s arc of discovery and redemption. His use in subsequent games, comics, and films, while cementing his place as an iconic symbol of survival horror itself, only served to cheapen him. Especially since he never seemed personally linked to any protagonist in the series other than James. But perhaps the scariest thing about Pyramid Head is that James never does actually defeat him. Pyramid Head only dies after his purpose is served. When James has been sufficiently reminded of exactly what he did, and brought down to his lowest point by the final death of Maria, the two Pyramid Heads finish themselves off in a bizarre ritualistic suicide. James may seek redemption in the end, but if the physical manifestation is anything to go by, he can never truly rid himself of his own guilt in the proceedings. 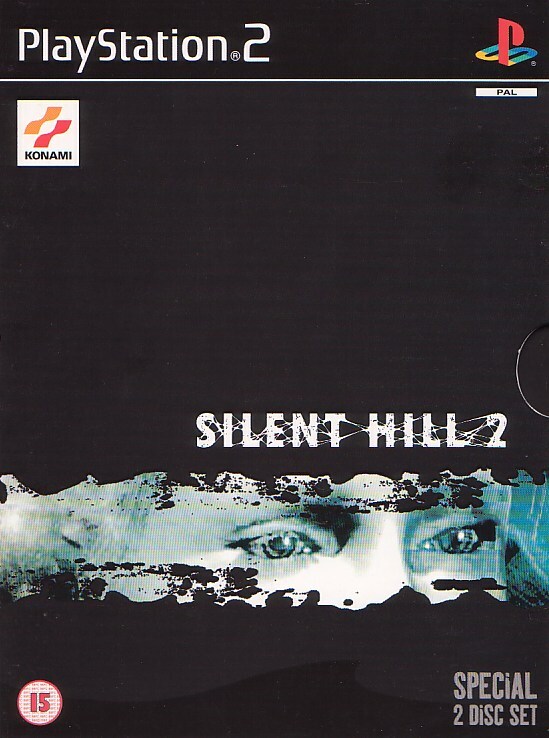 The final aspect of Silent Hill 2 to consider is the gameplay. Interestingly, despite possibly being the definitive survival horror game, there are several facets of gameplay that diverge from the conventions of the genre up to that point. The most notable example is the introduction of what the game refers to as 2D controls. Hallmarks of the genre such as Resident Evil and the first Silent Hill relied on ‘tank’ controls. Put simply, holding up makes the character run forward no matter which way he is facing, while left and right cause them to turn on the spot. It was a system that worked on the first Playstation, due to most games using the directional buttons. However, with the advent of Playstation 2, controllers had analog sticks as standard. While the tank controls can still work (as proven later by Resident Evil 4), they felt much less precise, and more prone to moments of frustration as players struggled to navigate a simple corner with changing camera angles. The solution was the option for 2D controls (which became the standard from Silent Hill 3 onwards). With this new setup, players could just point the stick in the direction they wanted the character to go, allowing for simpler overall control. Elsewhere, combat remains relatively unchanged. Melee attacks are still prone to miss, and there is no dodge button like later instalments have. It all adds up to a frantic experience, especially in the early going before the character has access to guns and health items. Higher combat difficulties manage to maintain the scarcity of resources (a hallmark of the genre), but on lower difficulties, ammo and health items are unfortunately plentiful. As an overall experience, Silent Hill 2 stands up for me as the game that defines survival horror. Where it sometimes falls down in terms of gameplay mechanics, it’s more than made up for in the storyline and underlying themes. To this day, the cast of characters and enemy designs are unparalleled. There is probably an entire book I could write on this game (and believe me, before editing, this post came close) but for now I’m willing to let this stand as my statement on it. Silent Hill 2 is the benchmark by which I measure all survival horror games. But the scariest moment for me is a much smaller one. There is a room in the apartment complex with a clock puzzle. Whenever passing through it, this music plays, and I have to run through, even after playing the game some 25 times and knowing nothing bad ever happens in that room. There’s just something about the sudden sound spike that causes a quick panic and discomfort, every single time. Banner created by Rachel Mansell. All other images sourced from the Silent Hill Wiki. This entry was posted in Surviving Horror and tagged Games, Gaming, ps2, Silent Hill 2, survival horror, Video Games by Chris. Bookmark the permalink.